No charges have been framed in the Akhlaq lynching case despite 45 dates set by court. Family’s lawyer alleges accused are delaying case. Bisara, Uttar Pradesh: Three years after Mohammad Akhlaq was lynched over rumours of cow slaughter and possession of beef, the case is stuck at the local ‘fast-track’ court. Despite 45 dates set by the court for the hearing since 2015, charges are yet to be framed against the accused. “The case was to be heard on 13 September, but due to a strike called by lawyers of Surajpur court, the matter could not be heard that day. The next date of hearing is going to take place on 5 October, and charges are to be framed against the accused,” said Ram Saran Nagar, legal counsel for some of the 18 accused. Advocate Yusuf Saifi, who represents Akhlaq’s family, said the battery of lawyers representing the young men accused of Akhlaq’s murder has each sought additional documents and filed applications. This, apart from strikes and holidays, has led to “slow movement” and delayed justice in the case, he said. “Nearly three years have passed since the charge sheet in this case was admitted in court. The defence lawyers are delaying it in some way or another, probably because they know they are guilty,” Saifi said. On the night of 28 September, 2015, a mob had assembled in Bisara village in Uttar Pradesh’s Dadri tehsil, following an announcement from a local temple. The announcement had asked residents of the village to gather near the “bada transformer” as “someone had slaughtered a cow in the village”. Minutes after the announcement, a section of the mob had forcefully entered Akhlaq’s two-storey house, dragged him outside, and beaten him to death. His 22-year-old younger son, Mohammad Danish, received severe head injuries in the assault. Amid allegations that there was beef in Akhlaq’s fridge, the police had also recovered some meat from the ‘crime scene’ which was examined twice. Hours before the police seized that sample of meat, suspicions about Akhlaq’s family slaughtering a cow had arisen when some young men saw a packet of meat being thrown away by Akhlaq. In the documents pertaining to the case, the role of an accused, Arun, is believed to be crucial in the belief that the meat found in the village was not mutton. “On 28 September, I was sitting near the bada transformer, where Shivam, Arun, Bheem and others were present. Then one dog started tearing a polythene bag near a drain. Bheem then found that the material inside was red in colour. Arun alias Annu, a veterinary doctor, then said that it was red meat,” Vinay, another accused who was a UP homeguard, said in his disclosure statement. The initial meat examination report — dated 29 September, 2015 — by a veterinary doctor at the Government Veterinary Hospital, Dadri, had stated that “prima facially, it seems, that this meat belongs to goat progeny”. The report had, however, asked the administration to take the samples to the forensic lab in Mathura “for final and confirm diagnosis”. In June 2016, the meat examination report issued by the Office of the Joint Director, Forensic Investigation Laboratory, UP University of Veterinary Sciences and Animal Husbandry, Mathura was opened in the court and it declared that the sample belonged to “a cow or its progeny”. This revived the demand for an FIR against Akhlaq’s family on charges of cow slaughter and animal cruelty. Soon after, Surajpal, a resident of Bisara, approached the court, stating in his petition that Akhlaq had admitted to the slaughter of a stray calf (of a bull) by his family. Stating that he had made “a huge mistake”, Akhlaq had asked the crowd for forgiveness, the petitioner said. Akhlaq’s younger daughter Shaista and son Danish, however, denied charges. They maintained that a mob had surrounded their house in Bisara, dragged their father out of the house and beaten him to death. “We did not kill a cow. The people, who came to our house, took the meat out of the fridge. That was goat’s meat sent by our relatives. They took the meat with them,” Shaista had told police. 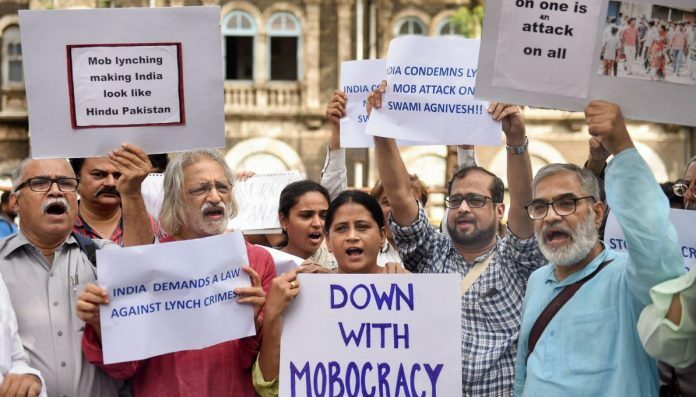 On 17 July, 2018, the Supreme Court issued a slew of directives to the Central and state governments on mob lynching and cow vigilantism, including pending cases. One remedial measure mentioned in the SC order related to the “expeditious disposal” of mob lynching cases. Since January, the Dadri lynching case has come up for hearing in the fast-track court seven times. In 2017, the case was listed for hearing on 13 occasions, while the figure stood at 25 in 2016, lawyers said. After the SC order, however, lawyers hoped that the case will be brought out of this legal logjam. “We are waiting for the government of UP to implement the court order in the state,” said Saifi, the lawyer for Akhlaq’s family. While district officials maintain that a directive from the state government is yet to be received, officials at the UP home department could not be reached despite several attempts.